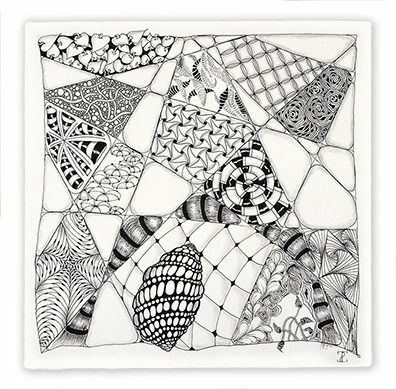 Last December, the Zentangle group that I tangle with, sent you a set of completed Opus tiles. When you sent us the tiles, you included a note that said "Would your group each do one & send them to us to photograph.... and we'll send them back to you." Members of the group have begun asking if I knew when we would get the tiles back. It seems, a few of them have been designated as birthday gifts. Any information that I could share with the group would be appreciated. "No. When did you see them last?" "I don't remember seeing them." After a slightly adrenaline charged search we found them safely placed where we wouldn't forget them(!). 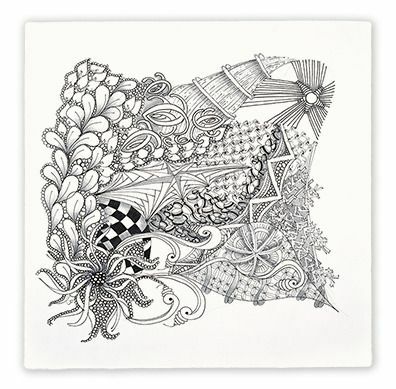 So goes the delicious, creative chaos of our Zentangle life under the watchful gaze of our guardian angels! Without further delay, we present these lovely contributions for your (and our) enjoyment and inspiration. 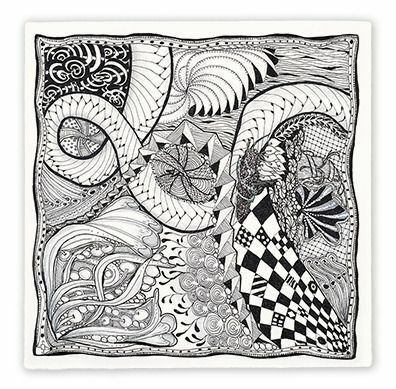 As you enjoy these wonderful pieces, please take a moment or two to appreciate the creative tangleations these Zentangle artists have woven into their creations. 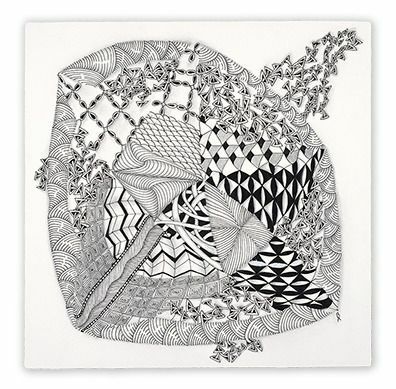 Zentangle has greatly improved the quality of my life. I sit in a waiting room and tangle away -- sometimes long enough to finish a tile. And sometimes I am called before I can finish and find myself mildly irritated that my "tangling time" has been interrupted. I carry my "studio" with me -- a pouch with tiles, pencil, pen, tortillion -- and the knowledge that I am fully engaged in the moment -- peaceful and content. We created this companion blog post so you can enjoy larger images of these pictures. Take a look so you can appreciate the detail and creativity that went into these. 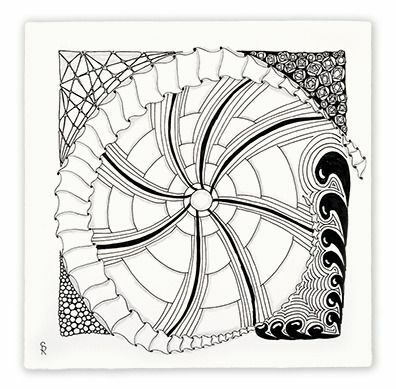 Zentangle Opus Tiles measure 10.5 inches (27 cm) square. 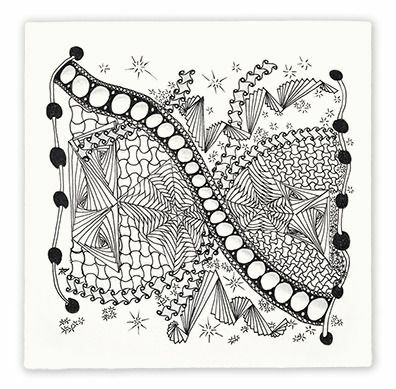 We make our Opus tiles from the same 100% cotton, mould made, archival paper as our original white tiles. 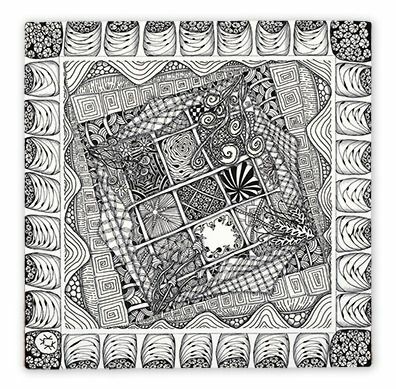 The perimeter of the back of this lovely tile is full of warm reminders of the benefits of practicing the Zentangle Method. 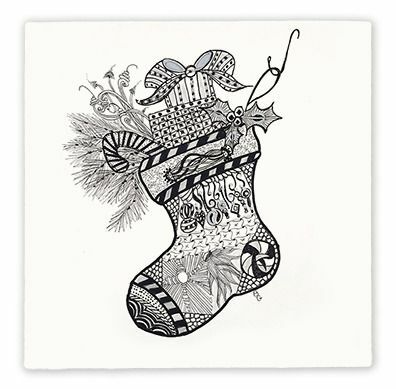 If attending a Certified Zentangle Teacher (CZT) training seminar in 2015 interests you, visit this link. Only a handful of seats remain. This wonderful adventure continues to grow in exciting and unanticipated directions. Thank you for enjoying it with us!